If you have a site about traditional toilets for example a good business name (for optimization reasons) would be Traditional Toilets or Toilets and the domain name would be traditional-toilets.tld or toilets.tld respectively. 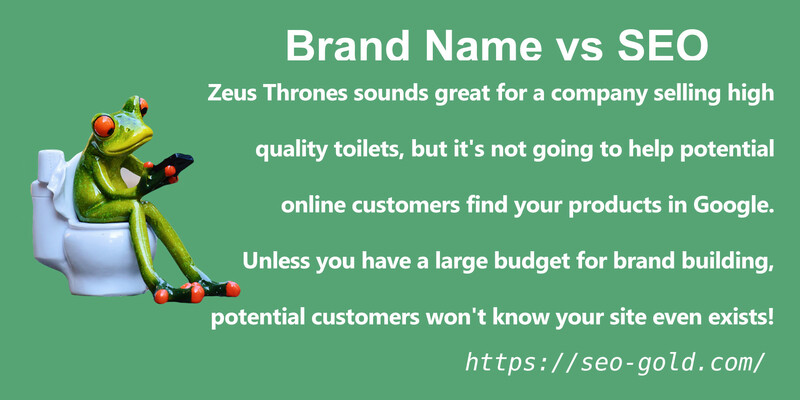 This gives a balance between a good SEO domain name (toilets.tld) and a brandable business name (Zeus Thrones). The balance being on search engines it’s clear the domain has something to do with toilets. On branding Zeus Thrones is a memorable/amusing name for a mundane product!